We have worked with Argent for a number of years and were pleased to be appointed to deliver the engineering services design for two recent buildings at their large Kings Cross campus in London – known as Building S1 and Building S2. The first, S2, commenced in 2013 and Argent – who always adopt a ground breaking approach – included the requirement for an advanced Revit model for the whole scheme in the design deliverables in order to clearly and accurately define the Employer’s Requirements to the contractors. To this end, we used Revit and BIM technology with the team from the outset of project S2 and then took the lessons learnt on S2 to refine the delivery protocol of the second building, S1. This enabled both cost and time savings in design, team coordination, and pre and post construction procurement and delivery, resulting in the project requirements being successfully delivered on time. 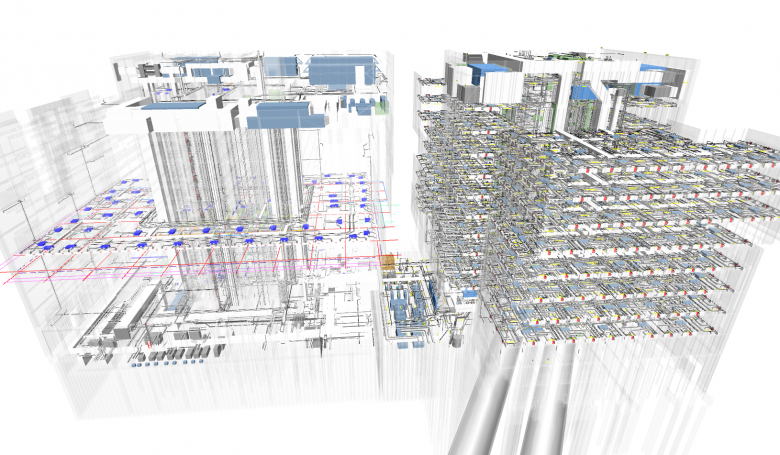 Depiction of MEP Services design in Revit has evolved significantly in the last few years, an evolution which has been particularly evident during the two year lifespan of these projects. We have gone from using Revit to provide validation and demonstration of coordination with architectural and structural elements, to the point we are at now, where the Revit MEP model forms the core of the overall services design with all services layouts created and designed in the model using the appropriate design software. On S1 in particular, the client’s desire to expose high level services which would ordinarily be concealed behind a ceiling has driven a greater degree of collaboration within the design team to refine the details of the services design so that it might meet the aesthetic standards and intent of the architectural design. 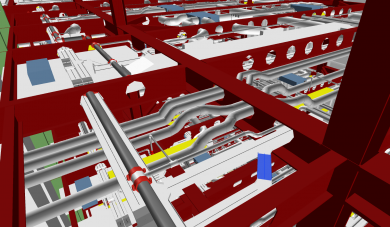 The adoption of the Revit model as the hub of the MEP design has enabled the production of an enhanced level of coordinated design information with the wider team, allowing design principles to be tested before tender, whilst still achieving a reduction in the overall design programme of approximately 20%. Whilst the level of detail in early design significantly increased our workload, the benefit to Argent is a fully co-ordinated and robust design and hence set of Employers Requirements, enabling contractors to understand the scheme, price less risk, mobilise more rapidly, and reduce the number of technical and design queries, ultimately saving time and cost. We have been developing a new generation of ‘digital engineers’ and a new breed of engineering capability in order to capitalise on the technology. Trained engineers now use their authoring tools and skills to deliver the highest quality of coordinated design once, without the need for ‘drafters’. 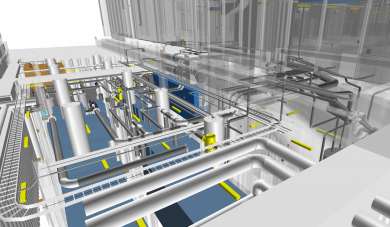 This project has also allowed us to enhance our workflow and management systems and develop new procedures to create an enhanced client and design team experience with total transparency of design, aligned to the PAS1192 theories of Level 2 BIM. The evolution of these two similar yet different buildings illustrates the significant advances made by Hilson Moran – using available technology and working closely with the design team in the application of BIM technology, we are creating significant benefits to our clients and they agree.